You continue on "your journey through the Universe." You locate the box of the constellation Pegasus, "go back" two stars (Delta Andromedae and Beta Andromedae (Mirach)) in Andromeda (who is "riding on the back of Pegasus"), and then "up two stars". After moving the telescope around in the region for a while, you see a fuzzy elogated object. 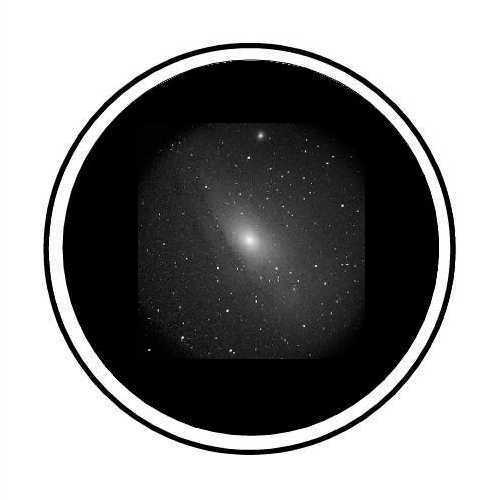 It is M31, the Andromeda galaxy: Wow! Your first galaxy. The Andromeda galaxy is the closest spiral galaxy to Earth. It is about 2.5 million light years away. This means that it takes 2.5 million years for the light to travel from the galaxy to Earth. You are seeing "old light" and an image of the galaxy as it was 2.5 million years ago! The above is brought to you by Jupiter Scientific, an organization devoted to the promotion of science through books, the internet and other means of communication.